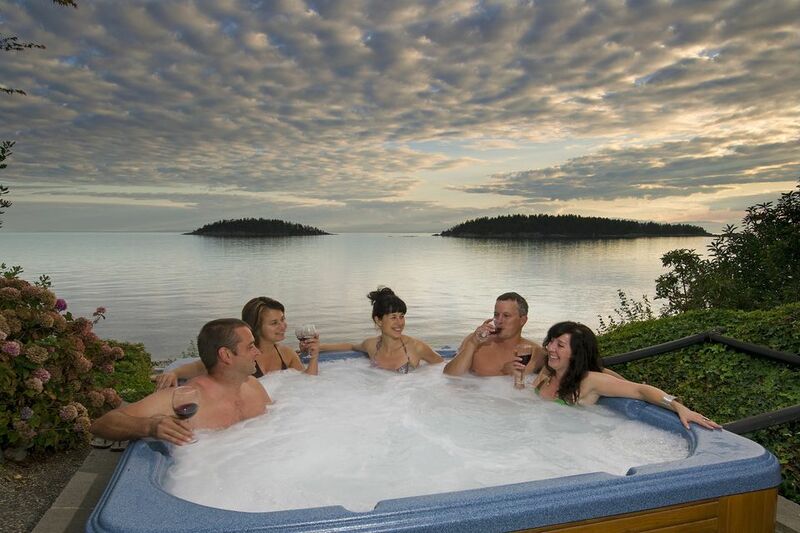 If you're lucky enough to own a hot tub or spa, then you probably know all the things you should and shouldn't do in and around the tub, like issues of safety, care, and maintenance. Or do you? How long can you soak in a hot tub? Is it OK to have two glasses of wine, but no more? A little sand tracked into the tub won't hurt, right? Will kids be fine in the hot tub as long as an adult is somewhere around? We help you review 15 smart things to do before stepping foot into that steamy tub. People with diabetes, high blood pressure, heart disease, or other cardiovascular conditions should consult their physicians before using a spa. Same goes for any medical condition: don't just consult an online medical site--get the OK from the doctor. Always shower first with soap and water to reduce the likelihood of contaminating the spa water and minimizing health risks. Lotions, oils, and other things contribute to build-up in your spa. In cold climates, it's not advisable to drain it -- so save yourself the extra cost of a possible repair bill by rinsing off before and after. Besides: isn't it nice to get into a really clean tub? Limit your soak time to no more than 15 to 20 minutes at a time. Cool off, then re-enter if you like. If a spa is indoors and inadequately ventilated, some users may experience slight throat and eye irritation. Ventilate it naturally or mechanically with an exhaust fan. Find another place rather than the spa's equipment compartment to store chemicals. Despite all of those stereotypes and hijinx we see in movies and hear about with celebrities, hot tubs and drinking don't go hand-in-hand. Refrain from drinking alcoholic beverages before or during spa use. Alcohol can make you drowsy and lead to drowning. Anyone taking prescription or certain over-the-counter medications should consult their physician before using a hot tub. Enjoy the soak in the tub, don your toasty terry cloth robe, and enjoy your glass of pinot grigio while sitting by the fire pit. Women who are pregnant should consult their physician before using a spa. People with long hair must tie it up to prevent the hair from being caught or pulled into the filter or drain. As a responsible owner, your spa should be equipped or retrofitted with drains or drain covers that meet code. Handrails and non-slip surfaces will help to minimize the risk of slipping and falling. Remember that wet surfaces can be slippery. Take care when entering and exiting the spa. Only enter via the spa steps. Do not step or climb on spa edges or filter lids. You may have heard about the Virginia Graeme Baker Pool and Spa Safety Act, and you know your pool, spa or hot tub should be equipped with an anti-entrapment drain cover. It will prevent a tragedy. Ask people to leave if they're unwilling to follow safe behavior. Test the water with your hand before entering the spa to be sure it is comfortable and not too hot. Make sure the spa is connected to a Ground Fault Circuit Interrupter (GFCI) protected circuit. This GFCI is required by the National Electrical Code (NEC) and must be installed by a licensed electrician. Test the GFCI monthly. Remove contact lenses before swimming or entering a hot. Despite all of those chemicals in the water, wearing lenses puts you at greater risk for developing a serious eye infection. Plus, they can get steamy.